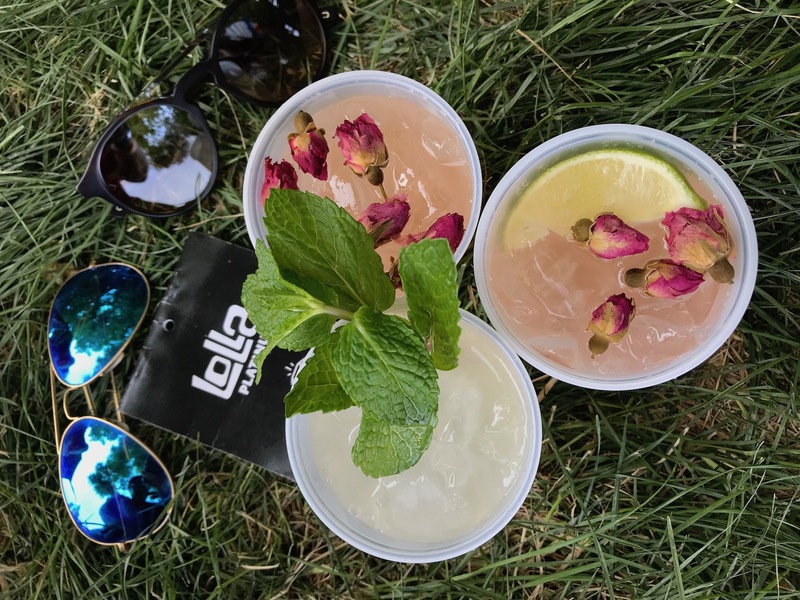 Every year, Lollapalooza takes the best elements of Chicago and rolls them up into super awesome, fantastic weekend. And that includes the FOOD. 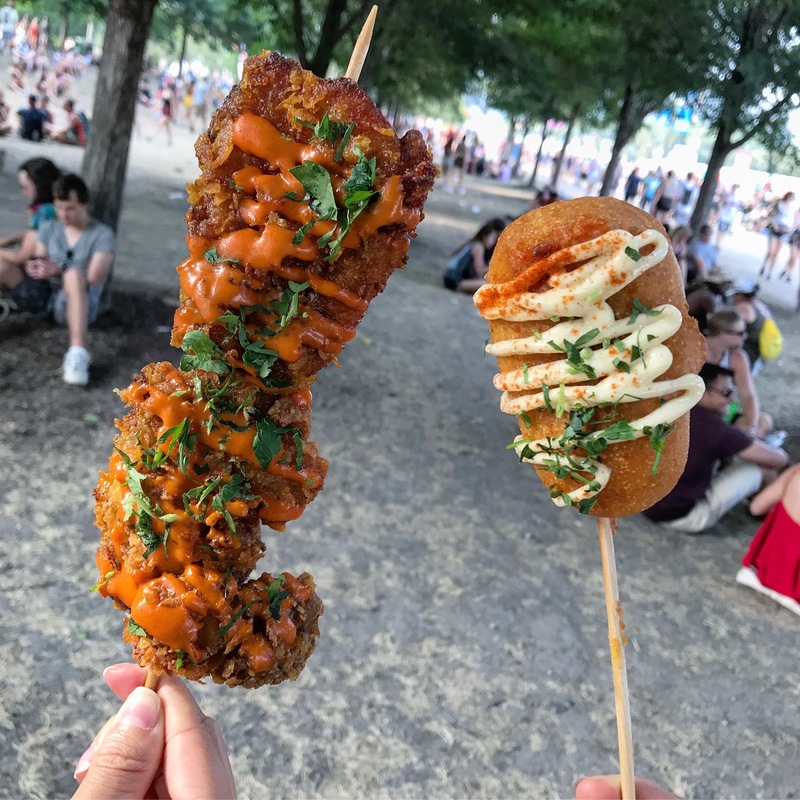 Lollapalooza has seriously yummy food which includes many local Chicago vendors. 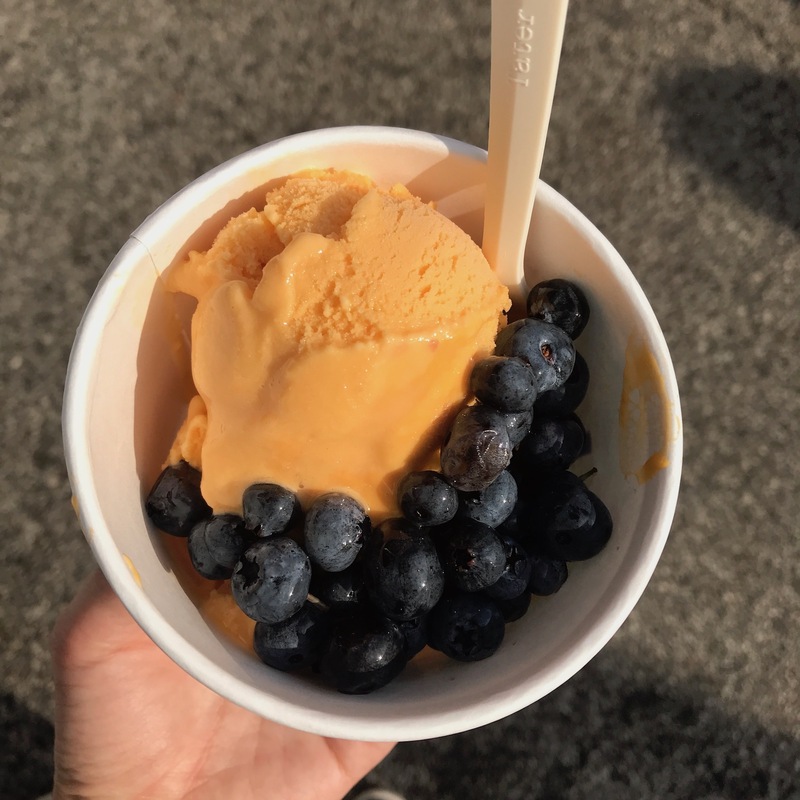 Despite being four days long, it’s impossible to eat everything at the fest (better come back next year!) 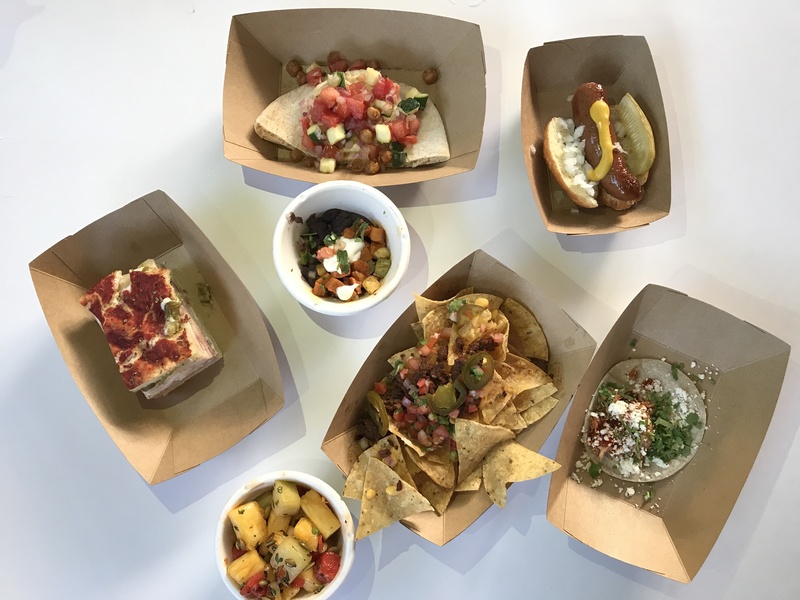 Here’s a breakdown of our culinary journey over the weekend. 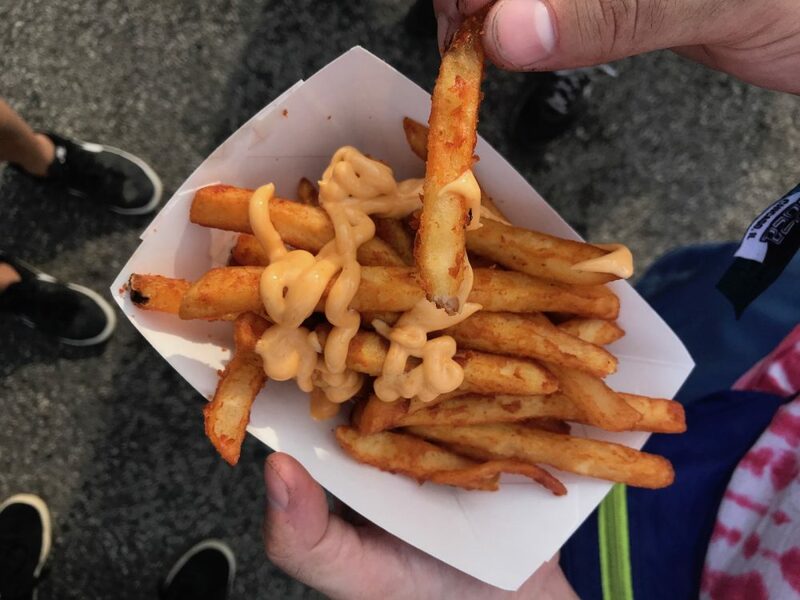 These crispy, spicy fries were the first snack of the day. Perfect for walking around and munching with your friends. If you’re willing to share! Goddess & Grocer Sriracha Fries! On Days 1 & 2 we came straight from work, so the search for dinner was one of our first missions. A slice of Connie’s pizza was perfect for Thursday, quick to eat and we can still walk around while doing so. 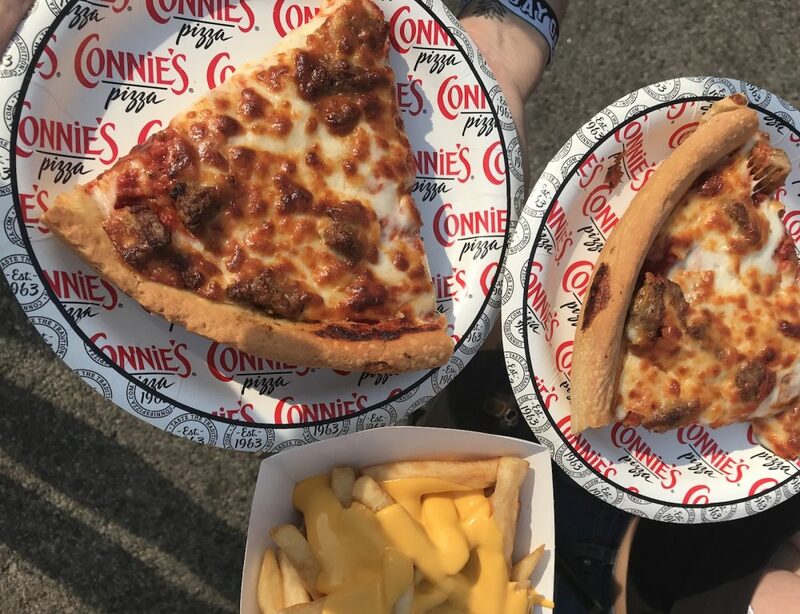 You can never go wrong with pizza! Later in the evening we decide it’s time to start drinking. I wander into one of the cocktail lounges and notice everyone is sipping on a pink, dried flower-topped drink. I stop someone to ask what it is. 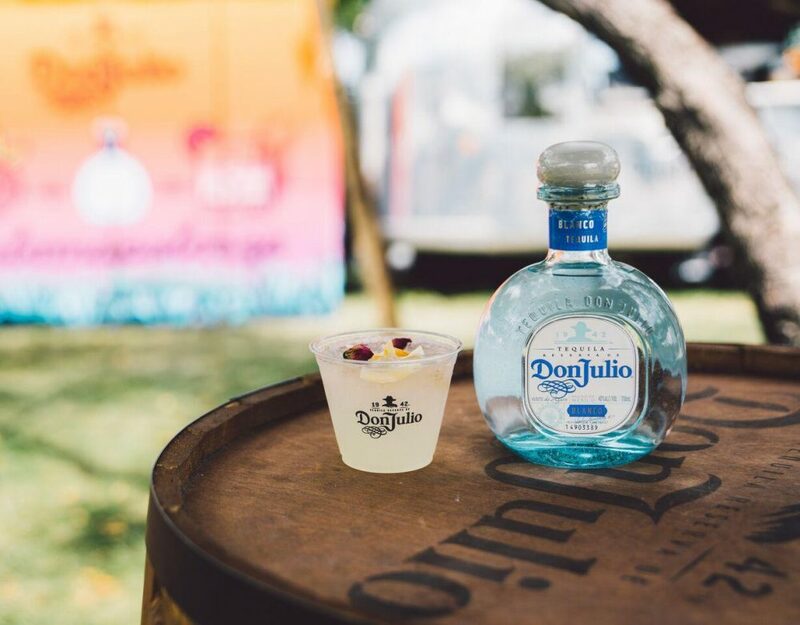 Turns out, Don Julio Tequila whipped up this creation just for the festival; it’s a paloma-inspired cocktail called the Palomapalooza with elements of lime, strawberry, and rose. 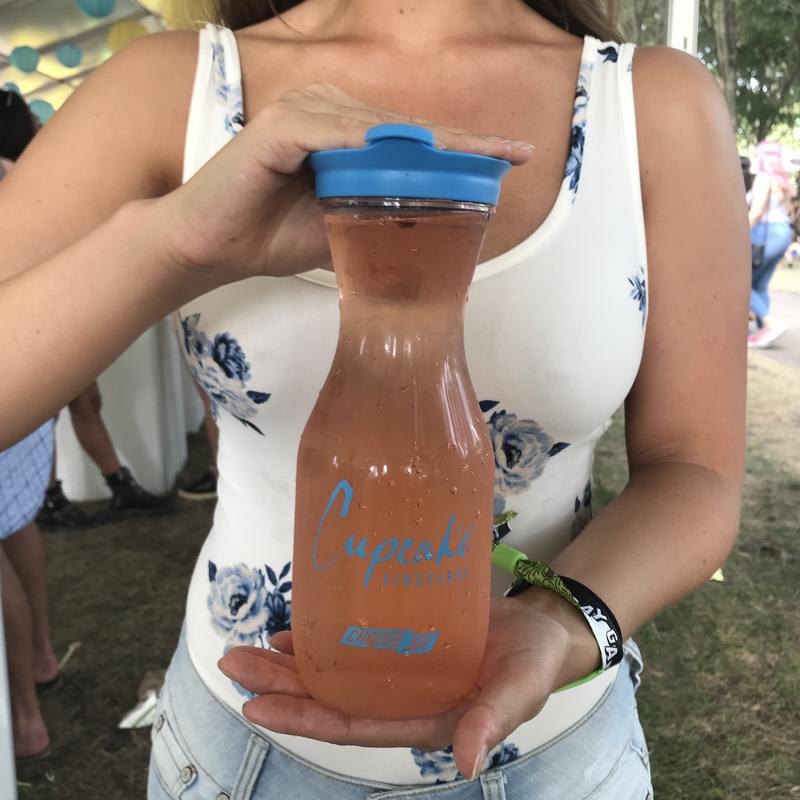 It's refreshing and a great first drink of the festival. I end up ordering more of these throughout the next few days! The Mad Social Chicken and Waffles are topped with syrup, powdered sugar, and bacon. It is a salty, sweet, fatty basket of indulgence, completely delicious. It is so delicious, in fact, that the person tasked with going and finding this magical item started eating it on the way back before I could get a picture, leaving me only a few bites left in one corner of the tray. I ask the girl holding this noodle salad if I can take a pic and she sighs, laughing. “Yes but hurry up, because I’m really hungry and this is really good. I had it yesterday.” I noticed the “Staff” label on her wristand and realize if she’s had this two days in a row, it must be good! 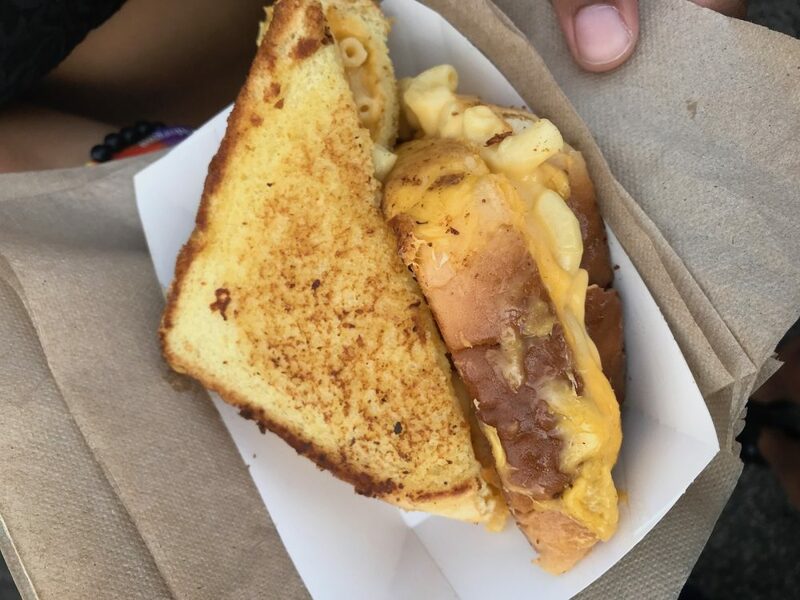 The Cheesie’s mac’n’cheeese grilled cheese will always hold a special place in my heart, as it was the first food I purchased at a Chicago music festival ever. 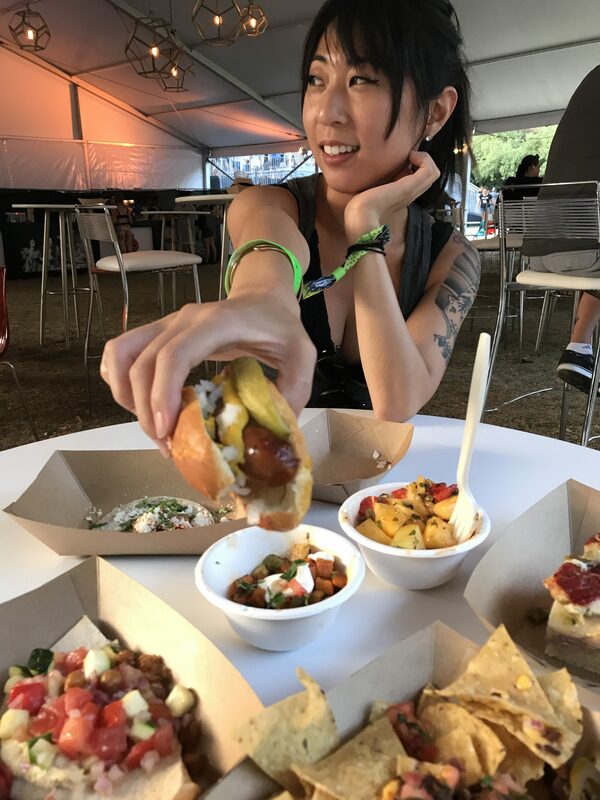 So long ago, in fact, I don’t even remember which festival it was, I just remember sitting down and biting into the thing and being momentarily pulled away from the thundering bass and crowds of people into a happy, cheese and carb constructed heaven. 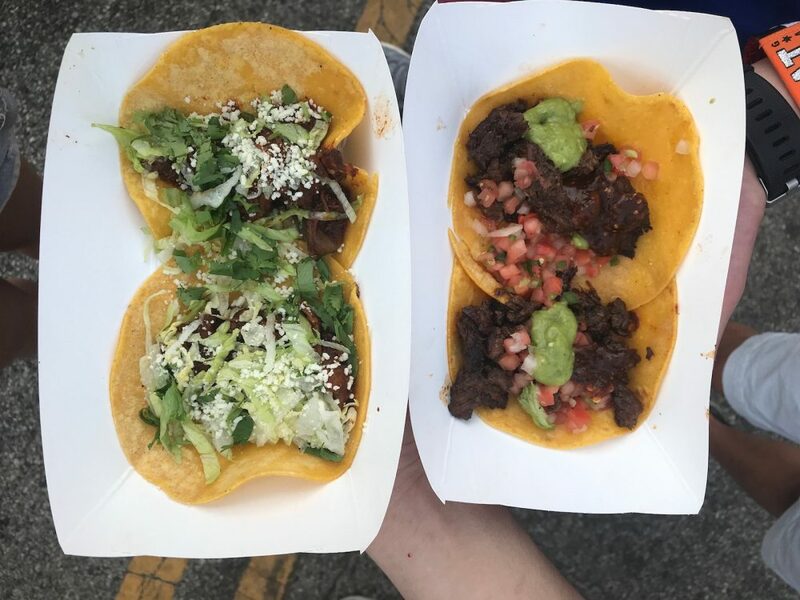 Since then, I make it a point to buy these at every festival where there’s a Cheesie’s truck and I haven’t looked back since. 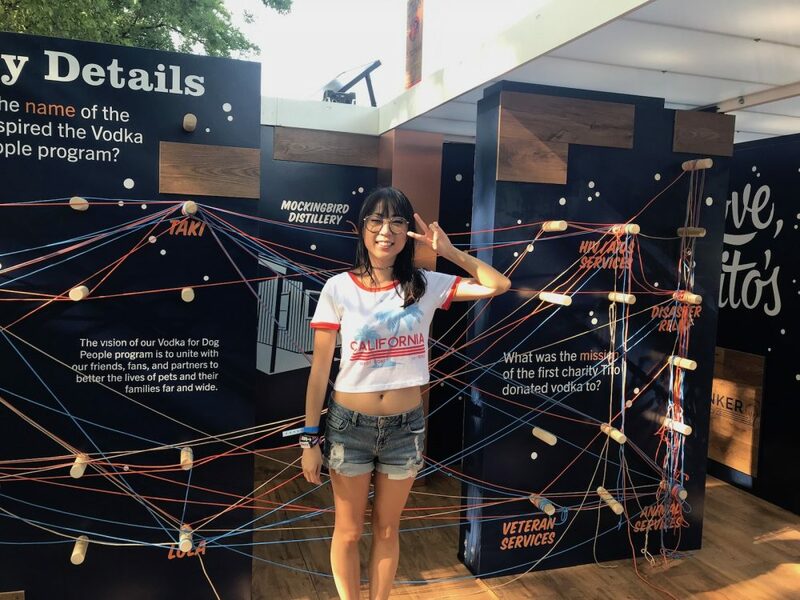 On the first day in the cocktail lounge I notice a cool looking exhibit with a bunch of colored strings, so I decide to check it out on Day 2. 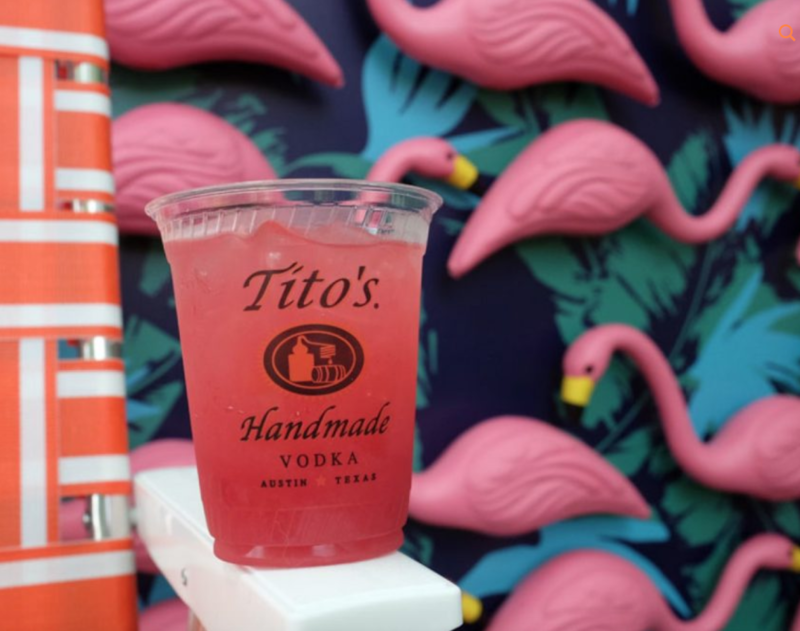 It’s the Love, Tito’s Vodka partnership with Bunker Labs, a national non-for-profit organization that helps veterans and active duty service members and their spouses to start and grow businesses. Very cool! 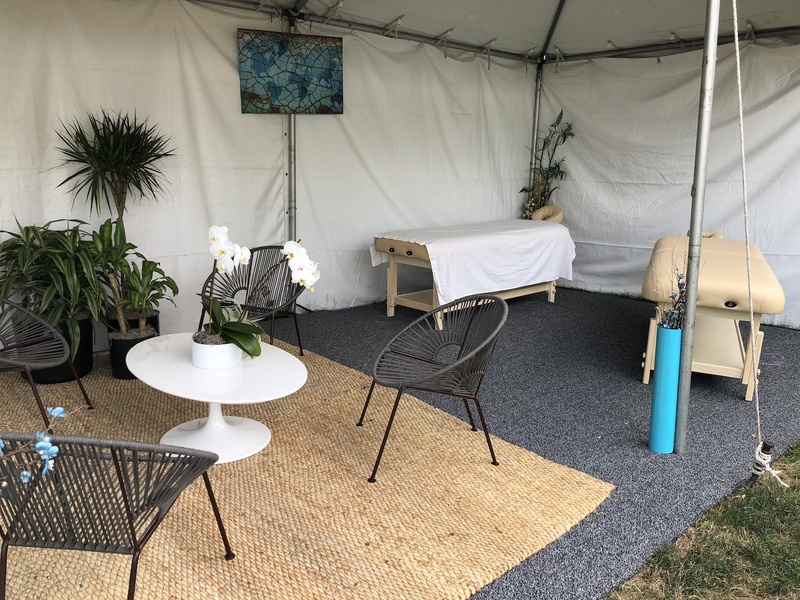 One of the pleasant experiences of Saturday was grabbing some boxes of Wow Bao, heading to the Cupcake Vineyards set up around the corner, claiming a small table and then drinking cold white wine and snacking on dumplings. 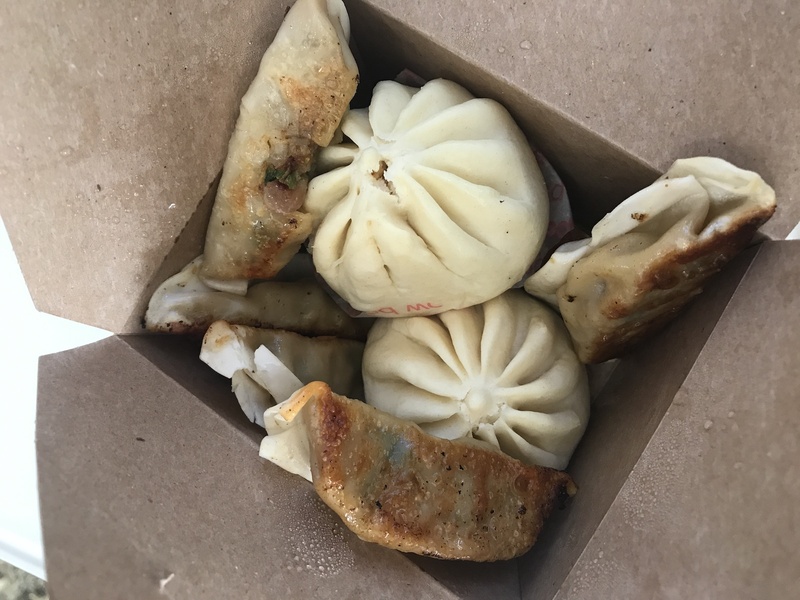 We tried a few different flavors of potstickers and dumplings, and the wine was perfect for cutting through the spice and carbs of our Wow Bao haul. Great way to take a quick break in the afternoon. The food mission for Saturday is to find and eat the Revival Duck Inn Dog. 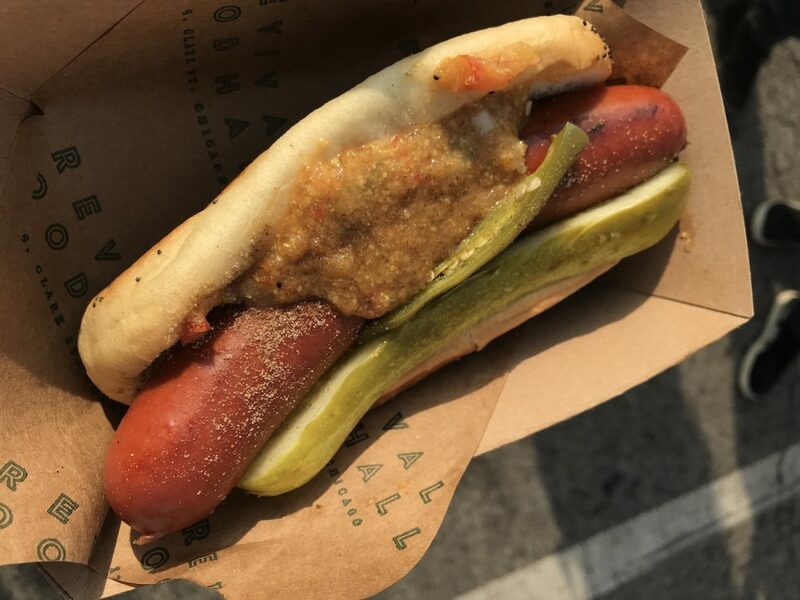 Made of all natural beef and duck fat, the dog is grilled and then topped with pickles and mustard made from scratch. I’m full from the dumplings but my friend has been excited to find this all afternoon. I want to ask him if I can have a bite after I snap a pic, but by the time I’m done fiddling with my phone it’s already gone. “Sorry,” he apologizes between mouthfuls, “But it was really tasty. The duck fat gives it a really delicious, rich flavor. The last mission for Saturday is to find the infamous Graham Elliot stand. 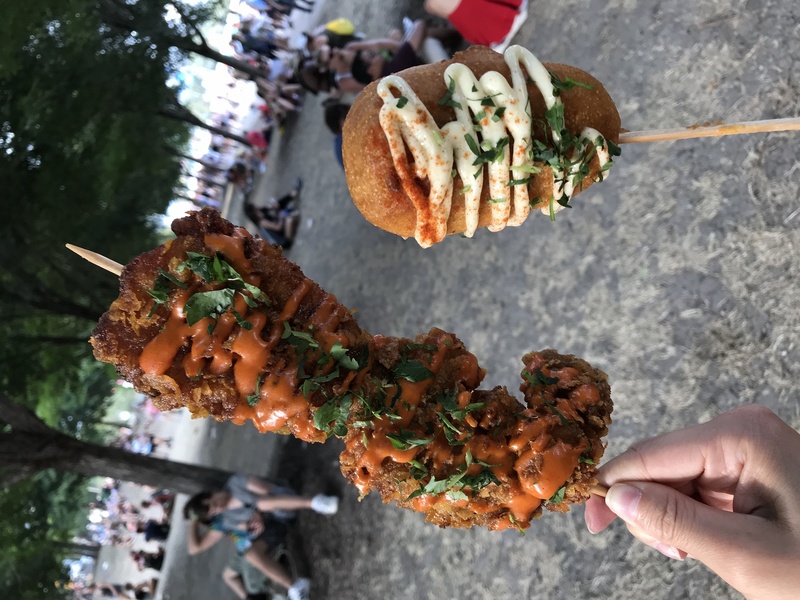 The lobster corn dog has become something of a Lolla tradition for me to eat, and both the dog and the fried chicken on a stick are items people will stop you to ask, what is it? Where did you get it? I love the dog but I am surprised that I like the fried chicken better! (The bite my fried chicken enthusiast friend leaves for me anyways.) It’s so crispy and the sauce adds just the right amount of flavor. 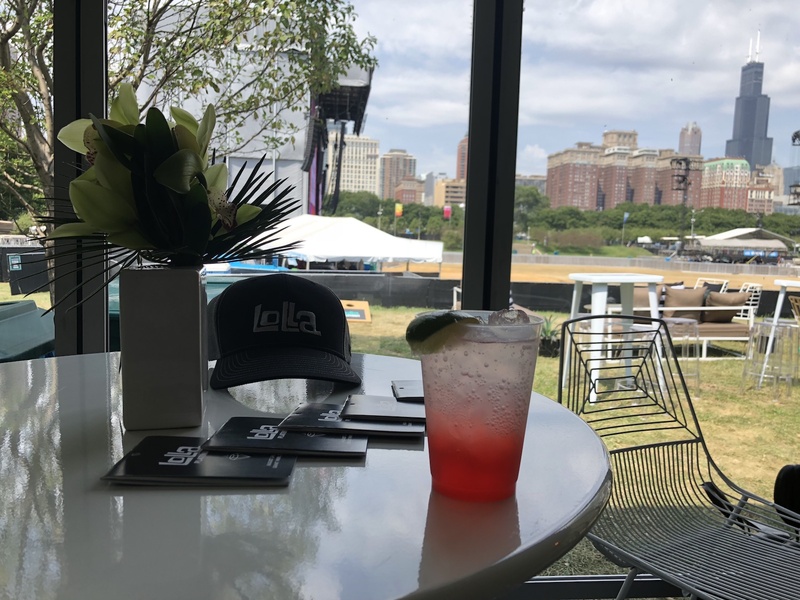 However the Chow Town adventures must come to an end, because on Day 4 I was able to experience and eat in the mysterious, magical unicorn Lollapalooza land of...PLATINUM. 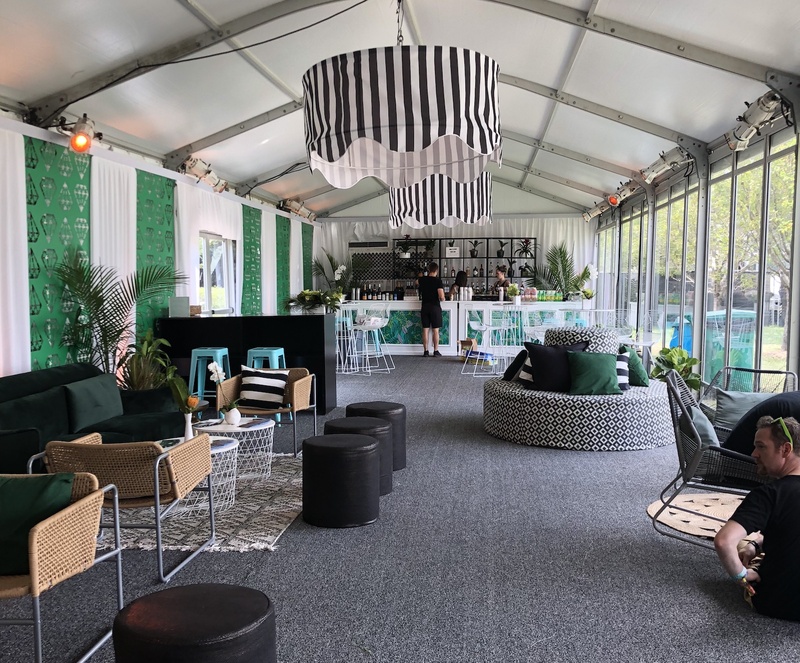 The Platinum lounges at Lollapalooza are an air conditioned, premium bar stocked heaven with massages, lockers, catered food and carts that whisk you from the Grant Park stage to Bud Light in minutes. Lines? What lines? Waiting for anything is unheard of here. Food includes yummy selections from avec, Dove’s Luncheonette, Nico Osteria and The Publican. It’s the perfect refuge from the heat, with free water, High Brew Coffee, and premium drinks at the bar. 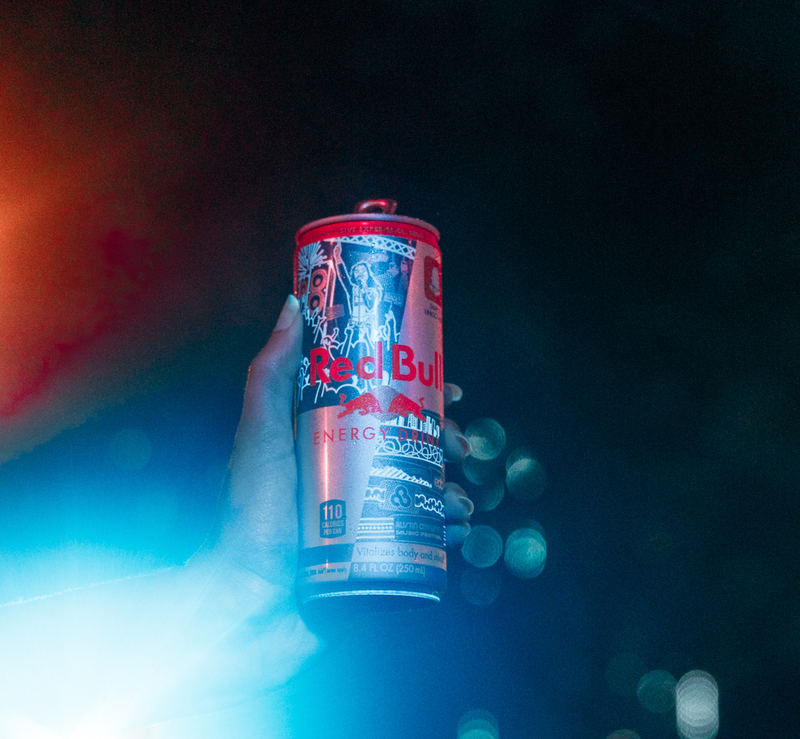 The drinks are strong and the bartenders mighty. There are no crowds and the bathrooms are cool and clean. 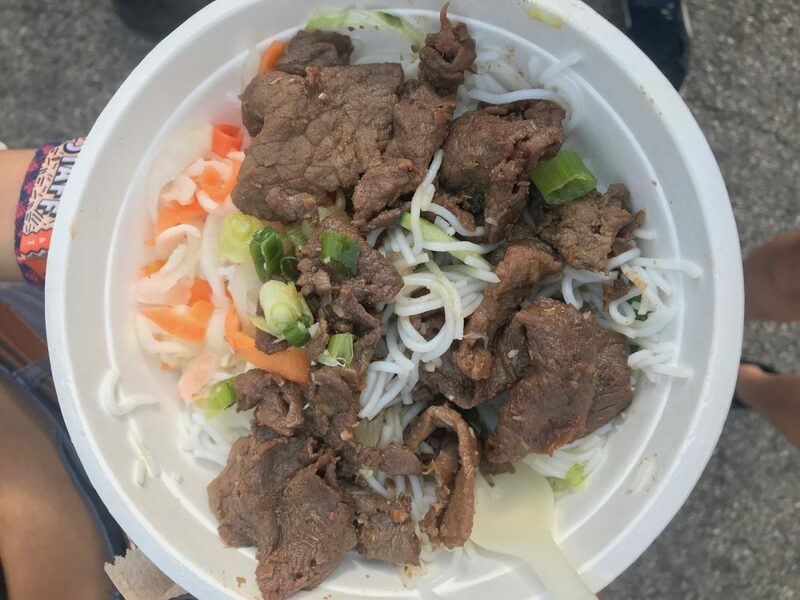 All of that physical activity made me pretty hungry, so it was time to check out the food….I wandered to the food areas and there is actually a slight line here, although it’s dinner time, so it makes sense. 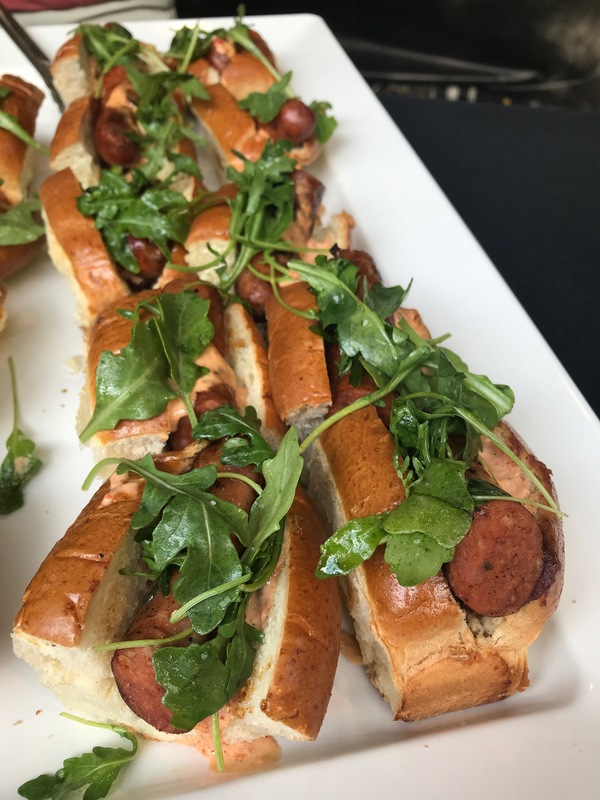 I quickly snap pics of fancy looking hot dogs, and then my friends and I bring everything we can carry back to a table. Feast time! 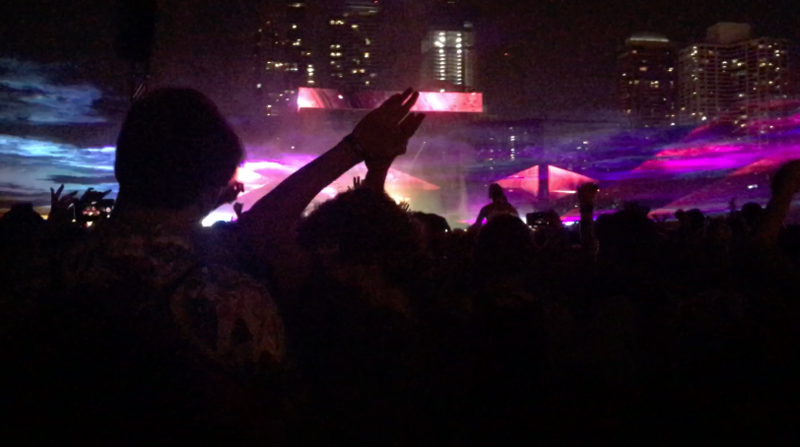 All in year this was one of the best Lollas yet, it was such a blast! 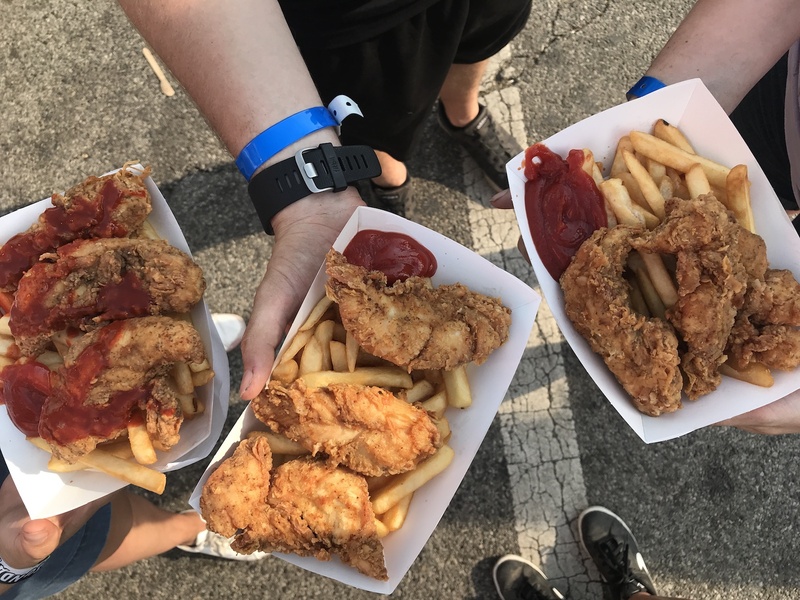 We'd love to see what you guys ate at the fest, please share your pics on social media and tag @Chicagofoodmag or #chicagofoodmag. See you next year!